Kinson Road Medical Centre is run by Dr Andrew Brewer, supported by seven associate GPs (Dr Philip Doust, Dr Laura Hamilton-Grey, Dr Emma McFarland, Dr Jo Shepherd, Dr Andrea Siggers and Dr Neeta Somani, Dr Robert Whitmey) and has approximately 11,000 patients. Our main surgery is at 440 Kinson Road and our branch surgery is in West Howe. We pride ourselves on being a very friendly practice and aim to provide a high standard of medical care to all our patients as well as a range of services to meet their needs. When you join the practice, you will be registered with a named GP within the practice but you will be able to see any of the doctors, subject to their availability. If you wish to know which doctor you are registered with please just contact reception, this is also usually shown on any letters we send to you. You may attend either surgery. When making an appointment, just let the receptionist know who you would prefer to see and at which surgery. The receptionists will do their best to accommodate your preferences but, if your preferred doctor is away or his/her surgery is full, you will be offered an appointment with one of the other doctors or the triage nurse. We offer a range of appointments including same-day (this may take the form of a telephone consultation with either a GP or triage nurse and save you having to come to surgery) and advance booking. We have calculated that in 2018 we have lost over 3 months of a GP’s time due patients who fail to turn up to appointments. That is the equivalent of one quarter of a year of a GP’s working time. This not only prevents other patients accessing a GP but also adds to the workload of our staff. This is not sustainable. Going forward we will be taking the necessary steps to prevent those patients who continually book appointments and fail to turn up. This could include removal of access to online booking and possible removal from the practice. We will always understand the odd occasion that prevents patients attending – but those that repeatedly book and don’t show may have to seek alternative GP services elsewhere. We are delighted to confirm that following our inspection in January 2018 by the Care Quality Commission Kinson Road Medical Centre has once again been rated ‘GOOD’ in all quality areas checked by the inspectors. We are delighted with the outcome and want to thank our hardworking staff and patients who participated in the inspection, and continue to support us every day. To get this recognition by our regulator encourages us to continue to improve and provide quality services. Thank you again for your ongoing support. To view the results click on survey results. The practice will be reviewing all comments and will put together an action plan. 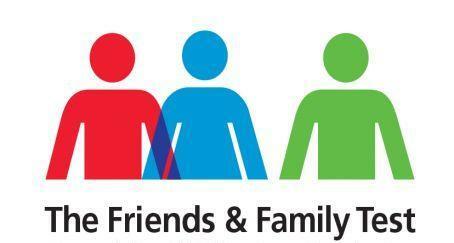 Why not take part in our Friends and Family survey? Just tick on the box below. The feedback from 309 patients in March showed that 243 were extremely likely to recommend our practice to friends and family, 40 were likely to, 5 neither likely nor unlikely, 7 was unlikely to, sadly 12 were extremely unlikely and 2 didn't know. Patient Online Access is a facility for patients to make an appointment (routine and non-urgent), request their repeat medication and view their medical records online. For information read the leaflet below. Should you wish to apply for online services you need to complete the form and return it to the practice. You will then need to collect your registration details and provide some photo ID. Click below to do our Friends and Family test!